Shamrock V- 1930, Irish. 14th challenger. First of the J-Boats; last of the Shamrocks. 134 Tons, 119 ", 7540 feet of sail. Lost to Enterprise. The America's Cup Races. I hand cut the sails & sea gulls from Rice paper, rigging is hand cut from antique ledger paper, hull & masts cut from Silhouette paper and Color Aid papers. 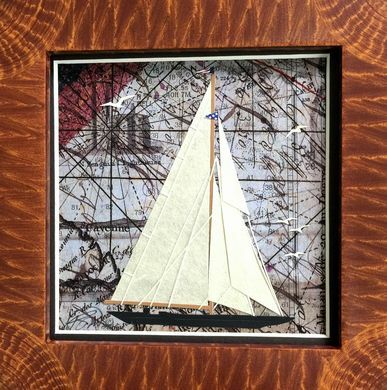 Background created from my nautical maps and antique maps with light houses.